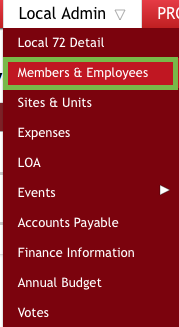 Under Local Admin is the Members & Employees tab. There are several options available on the tab. The Membership Applications table is available for approval of pending membership that have been submitted electronically. Using the button, you can Enter New Membership from Paper Application to have the member’s name appear immediately on your membership list. In both cases, the actual membership is pending until Membership Services handles the application. A second button lets you send E-mail to Members of your local who have a personal email address in the database. If an executive officer finds an application has been submitted electronically, a quick review give the ability to Approve or Reject by activating the appropriate button. 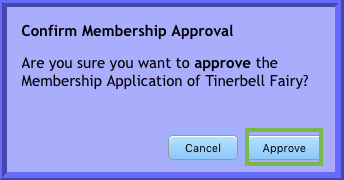 Clicking Approve will prompt for the Confirm Membership Approval screen, click Approve. 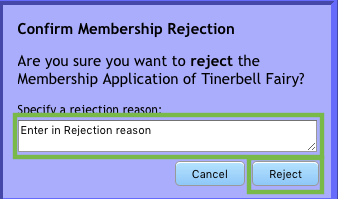 Clicking Reject will prompt for the Confirm Membership Rejection screen, click Reject once a reason is entered. ** The remainder of the Membership Application process is completed by Membership Services. The application can also be done by paper see the Paper Application process.